The Royal Navy system of rating ships defines a “sixth rate” as a small frigate: a single-deck ship, square-rigged, with around 28 nine-pounder guns, and a crew of around 200 men. This is the smallest vessel in the system set out by Samuel Pepys (the very same fellow who is now famous for his sometimes rude diaries), and the smallest command of a post captain. This means that sixth rate captains are either old men, passed over for command, or young, ambitious officers looking to make their mark. It’s also worth pointing out that, even with “only” 28 nine-pounder cannons at his command, the captain of a sloop has more firepower than many generals ashore! Historically, the sixth rates’ small size made them handy for scouting work and perfect where speed and good sailing qualities were required. 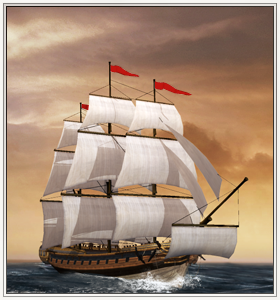 They were a very good counter to privateers in smaller luggers, brigs and sloops; sixth rates can chase them down and have enough guns and men to win the subsequent engagement! They were also extremely useful in blockades, as they could sail in shallow waters and keep close watch on enemy ports. A shipwright needs somewhere to build ships, even if this is only a slipway and a timber yard – but any piece of firm foreshore will do for smaller vessels! A dockyard can carry out major shipbuilding work, and usually includes a large number of associated artisans and tradesmen from coopers to victuallers. A dry dock is a large brick or stone basin with a set of watertight gates. Once a ship has floated in, the lock gates are shut and the dock drained. A naval hospital gives high quality cares to the sick and wounded. A sailor who finds himself looked after here can count himself lucky! A steam drydock is a magnificent achievement of an industrializing nation: a manufactory for ships without equal!